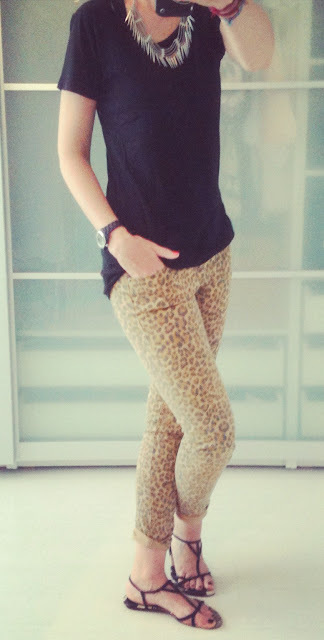 Gepost door My Scrambled Style op 9:26 a.m.
lovely outfit, been looking for the perfect leopard pants. I love your outfit *.*! I just love your style girl! Love the leo-pants an the sandals, really fits you well!!! Hi dear, I love this look! The pants and your necklace are perfect together! Hi dear!thanks for your comment! i'm following u! hope u'll follow me back! I really love your outfit! Really cute, but still a diva. I follow you now, so take mayby a look on my blog..
definitelly I like it ! love those cheetah pants paired with the sandals! Ah die leuke broek! Staat je goed! Wow wat een toffe outfit! Ahhh je broek is onwijs leuk! Just got back from my vacation, sorry for the late reply!! Loving your leopard pants and shoes!! I love the necklace!! Is it from this season? Nice photo and really cool outfit, you look great, I like your pants, what a great print and that top is so nice, the perfect touch to the outfit also your necklace rocks! Your blog is lovely by the way and I am a new follower! Hope you will like my blog and follow back! Those pants are fierce! There's not an H&M that close to me so I'm super jealous of your pants and necklace right now! In The Netherlands we can also order online :-). you have the best printed pants I swear! I love these leopard ones even more than the last ones you sported on your blog! I've been seeing leopart pants everywhere! Another animal print invasion perhaps? Leo prints are the best :-D! Love this print pants! Great look! Now following!! Love those pants, need to get one of those asap. Your accessories are beautiful - love! I am obsessed with the print on your jeans! So cute! hi i saw your comment!! Thanks for the comment back ;-). Alweer zon gaaf accessoire! Is het spike necklace?